Putting the Laundry Room Back Together! Remember how I’m crazy and putting in my second laundry room in this house in the space of 5 years? Fun times with fickleness. Step #1 was demolishing the chimney. We’ve discussed this. It was painful but worth it: otherwise my options were to have the machines side-by-side next to the chimney with no sink (where my floating desk was) or stack the machines and have a sink but no other work surface really, or demolish the chimney and have side-by-side machines and a sink. The last option won out, but left a big hole in the floor, the ceiling, and about a foot and a half of missing wall from floor to ceiling! Cute. Step #2 was getting the electrical in place. Evidently I did not take pictures of this, but that doesn’t mean it just happened by magic! The room had two existing outlets, but a washing machine requires a dedicated 20-amp circuit and a dryer requires a dedicated 30-amp circuit, so both had to be brought up to the room. Luckily, this was very uncomplicated: my old laundry room was further away from my electrical panel than the new one, so it was just a matter of turning off the power to those circuits, pulling the wires back through part of the basement and up the new chase (where the chimney used to live!) and into that back wall. This kind of stuff is actually super simple to do yourself with the slightest amount of know-how, but of course if you have any concerns at all or even dead wires make you queasy, hire a qualified electrician. Duhzville. Once that was done and my electrical boxes installed, it was on to Step #3: drywall! 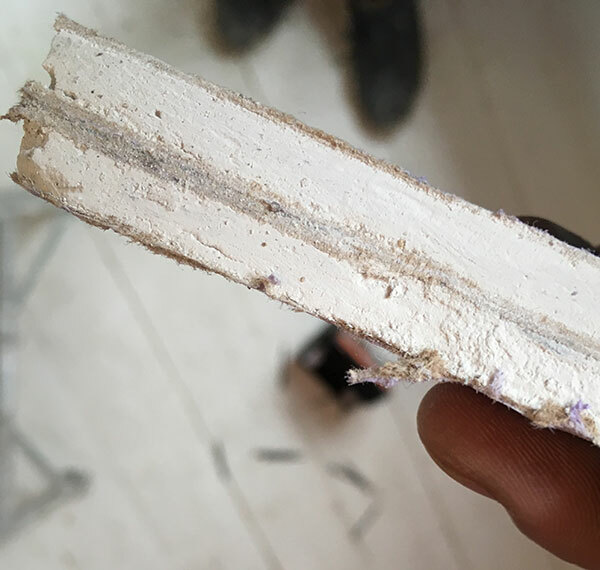 Typically I would have tried to patch the missing section of plaster left by the chimney demolition, but in this case I had the depth on my baseboard to add another 5/8″ thickness to the wall, so I opted instead to just drywall over the whole wall. The biggest reason for this is noise: luckily my machines are pretty tame, but I’m still moving big laundry machines to the second floor, basically in the middle of the house, and on a wall that backs to my bedroom, so some additional sound-proofing seemed to be in order! 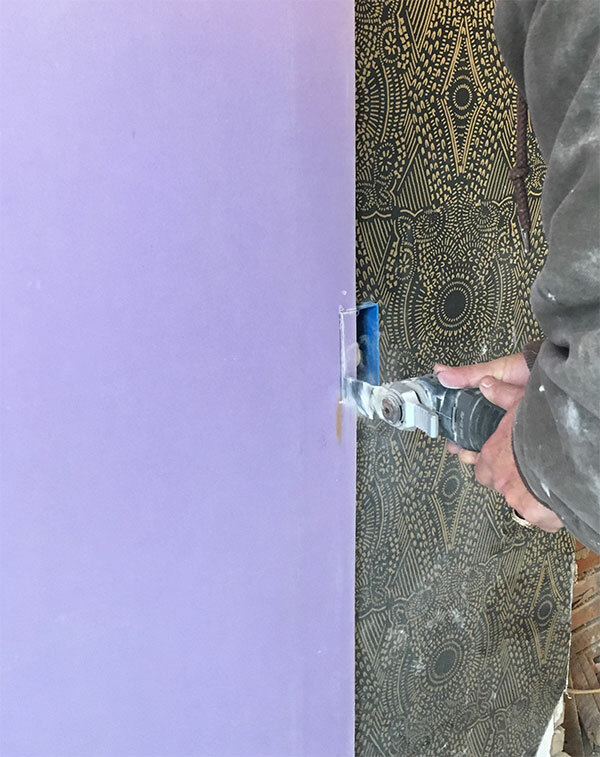 I wrote several months ago about the line of Purple XP drywalls, and National Gypsum was kind enough to supply the drywall for this project so I could test it out. This is the SoundBreak XP, which is essentially two high-density gypsum boards with a goop in between that blocks sound transmission that would otherwise occur through the wall. It’s also mold and mildew resistant, which is nice now that this room has plumbing! My thought was that leaving the remaining plaster behind it should provide additional sound insulation too, but otherwise you’d probably want to insulate the wall if things are all opened up. 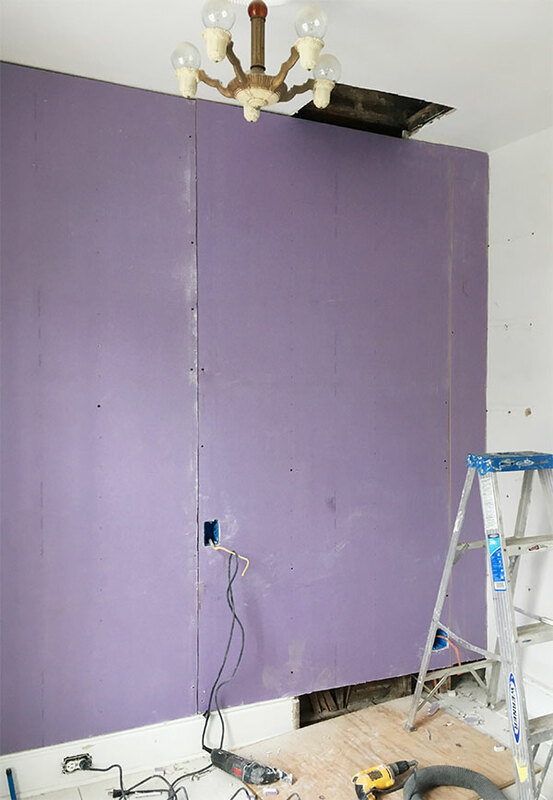 Working with SoundBreak differs from more standard drywalls in a number of ways. First—both sides of the board look the same, but only one side (clearly marked) is supposed to face out. Second, SoundBreak should be installed vertically—not horizontally! Huh! I think it may be to keep seams contained only to where they’re backed completely by framing members. Third, SoundBreak—due to that layer of goop—cannot be scored and snapped like regular drywall can: you have to cut it with a saw! As you might imagine, this is very dusty and ideally should be done outdoors with a good respirator. A circular saw is best for straight cuts, but we were working in tight quarters and used my handy little oscillating saw to get the job done. Fourth, it is HEAVY. I can lift a sheet of 1/2″ lightweight drywall without too much effort, but I cannot lift a SoundBreak board—so be warned that hanging is likely a two person job unless you have Hulk-like strength. 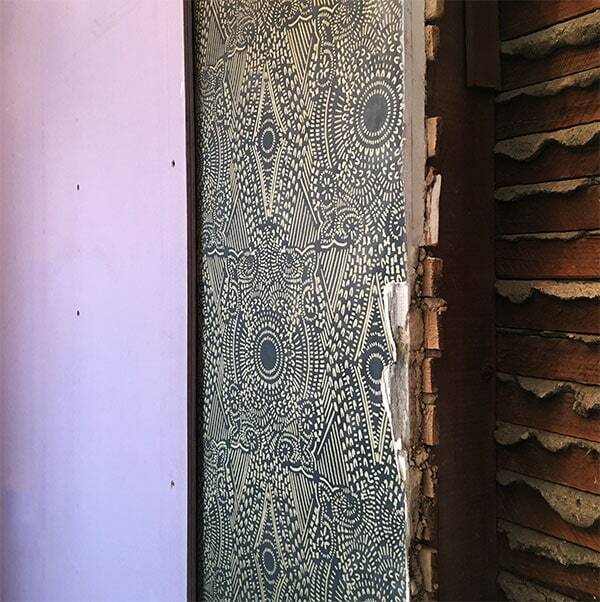 And, since you asked: YES covering up that fabulous Hygge & West wallpaper was a sad moment. Don’t take it personally, wallpaper, I still love you so much! That being said, I still have an entire roll of it (first floor powder room, anyone?? ), and it’s still in production, and…ya know, there are worse sacrifices. There’s something I sort of like about hiding it behind the drywall, though, like a little time capsule! It’s gonna be OK. Here you can see the part of the baseboard I had to patch. It’s behind the dryer so I’m not SUPER concerned about it being perfect, but…ya know, I want it perfect. In part because I do not trust myself and now that there’s no chimney in here, this room can actually fit a twin bed…QUIET DOWN, VOICES IN MY HEAD. Also, that piece of plywood is covering the big hole in the floor where the chimney used to be! Without it, you could stand in the attic and look all the way down to the basement floor, which is just an odd new experience to have in your own house. ANYWAY. Once the drywall was up, I patched the missing piece in the ceiling and then enlisted Edwin and his mudding and taping skills to get the walls and ceiling ready for paint. The finishing work here isn’t anything crazy, but he can do it so quickly and well that it usually feels worth it to save myself the headache. Normally you’d apply paper or mesh tape and 3 coats of joint compound to the seams and over screw holes, but I like to overcomplicate literally everything and skim-coat the entire wall as a final step, too. 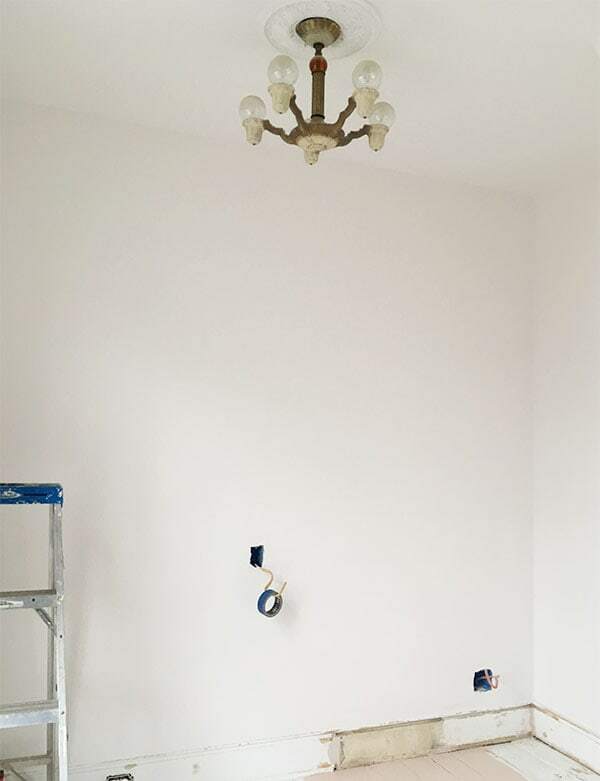 I find that this gives new drywall just enough irregularity once painted to match adjacent plaster walls, since those are never so perfectly smooth! It’s getting there! It’s getting there! Luckily I had a scrap of baseboard that was large enough to patch in the missing section, and old pieces of subfloor to patch the floor. It’s nice when the house provides the material to fix itself! 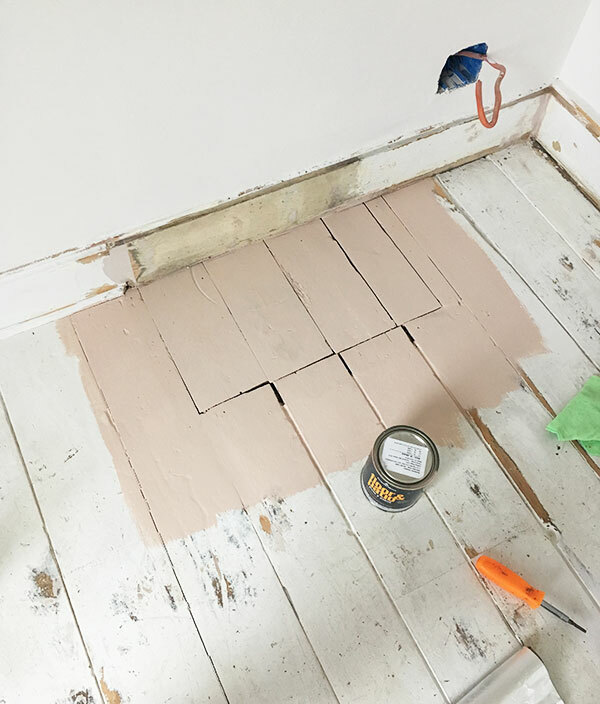 The patched floorboards are the same dimensions as the originals, but the joints are tighter so things don’t quite line up. Don’t care! It’ll be covered anyhow by the dryer, but I don’t really mind funny staggered patches like that in wood floors. Speaking of wood floors, now is the part where I openly admit: I cannot have white painted floors. My god, they are not for me. Some people (Swedes, primarily) seem to have no problem keeping white painted floors looking great for years, and I admire them. But the combination of dogs and a house under construction and frequently using the window in this room a couple years ago as an entrance while Edwin and I tore down additions and worked on restoring the exterior of this side of the house left these floors pretty destroyed and terrible looking. Even before that, they drove me crazy. Never. Again. 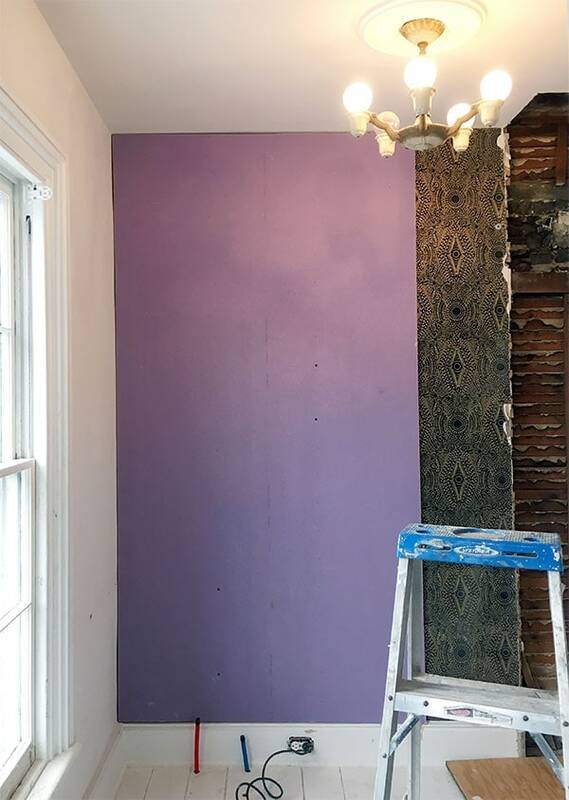 But…remember how I mentioned that this renovation is really just about getting the major players in place without draining significant funds, time, or mental energy? I mean that very seriously. For a while I was so hung up on needing to install a tile floor or run the wood flooring from the adjacent room into this one that I would get overwhelmed by the whole project. It would cost a lot! It would take a while! And it’s such a COMMITMENT and I don’t even really have a fleshed out design plan for this space so I don’t even know what I want! And I refuse to let this become a big project so I don’t even really want to have to know what I want! WOE IS ME! THEN I realized I could actually just re-paint my fucked up white floor and nobody was likely to die as a result! Isn’t that something! Sometimes reigning it in is difficult for me. Like all the time. So. I patched a bunch of the larger gauges with Bondo, caulked here and there, chose a color off a paint chip (seriously, why in the world I think I can do this but would never advise anybody else to is beyond me), thoroughly cleaned the floor, and painted it! Immediate Uh-Oh I Hate This. 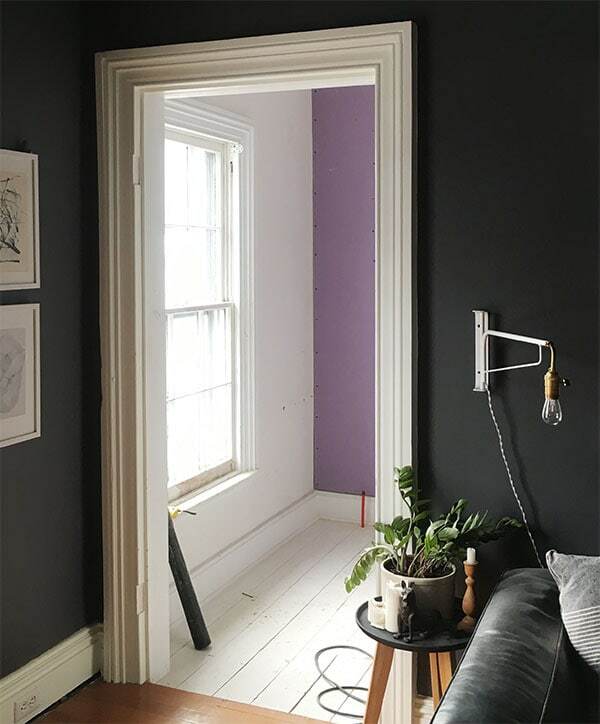 The color is a color-matched version of Farrow & Ball’s “Setting Plaster” and it’s roughly the color that would result if dried Bondo and a Band-Aid procreated. As a frequent user of both, this was not exactly what I had in mind. While I stewed on that, I painted the walls and ceiling. I did not exactly think this through—I actually intended to just paint the new wall and touch-up just where necessary in the rest of the room (because restraint! ), but once I got into it I realized how much everything would really benefit from a fresh couple of coats (because perfectionism!) so I ended up repainting the whole thing! Had I decided this beforehand I probably would have gone with a different color, butttttttt whatcha gonna do! On the plus side, I still had enough leftover paint from the first time around to eek out two coats! 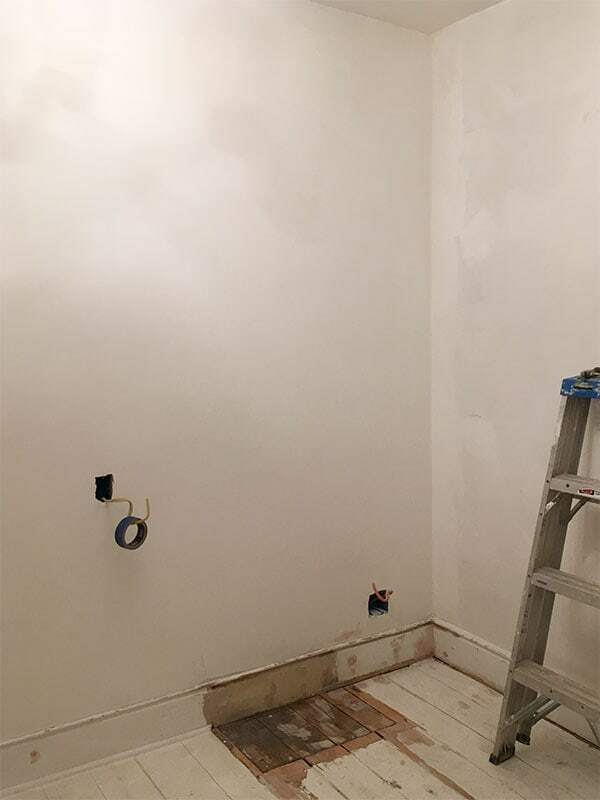 The paint is Clark + Kensington flat finish, and the color was called Casa Blanca but I cannot find it on the internet for the life of me and I think maybe it’s no longer part of the color deck. I’ve had the can for 5 years; who knows. Unexciting color choice notwithstanding, there’s nothing like a fresh coat of paint. Even at this stage the room felt kind of…pretty? 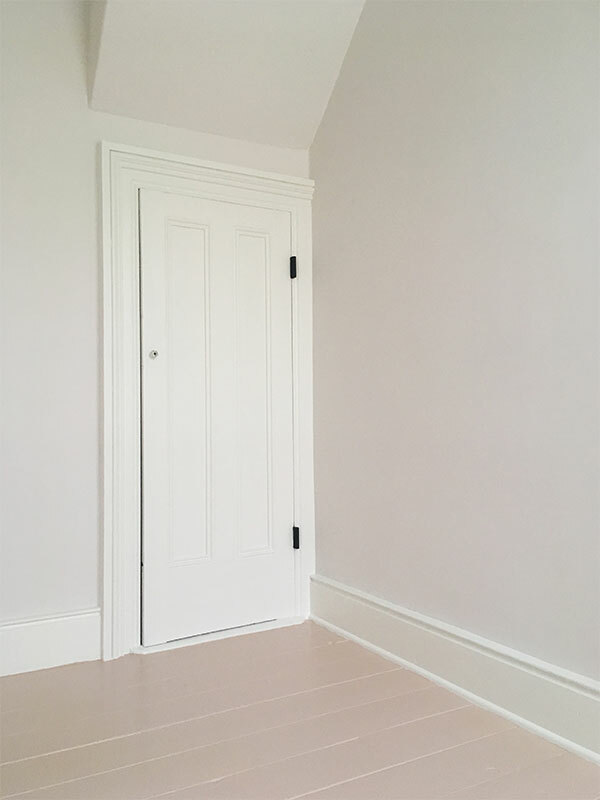 I repainted all the trim Benjamin Moore Simply White which I’ve used all over the house (and also had the paint already!) 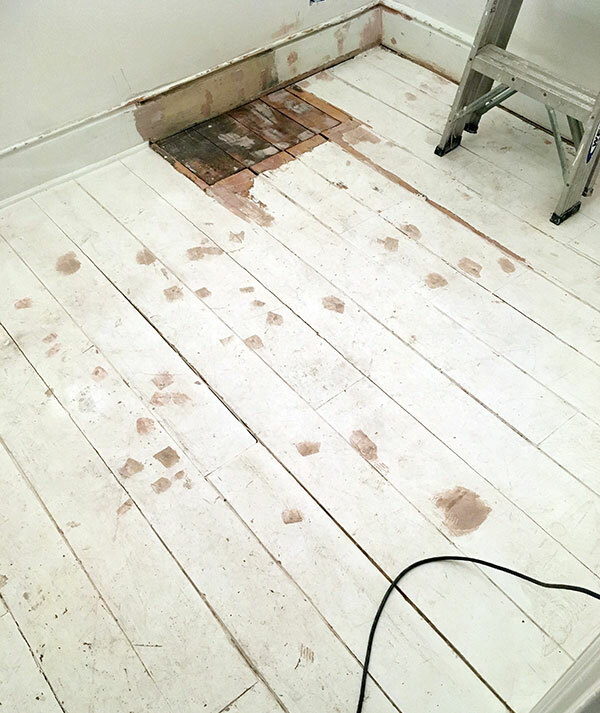 and then forged ahead with the floor, figuring worst case scenario I’d just call this the primer and do something else…and then a great miracle occurred! I LOVE it! Context, man. It changes things. By the way, that’s the little teeny closet door for the little teeny closet under the attic stairs. It’s one of the cutest things in the house and makes me happy. Also, the laundry room is going to have its very own little closet! For stuff and things! So. My quick n’ easy just-make-it-function laundry room got a little more TLC and time than I was even intending to give it, which honestly at this point I was pissed at myself about. BUT! It really feels like a whole new space, and ultimately I think I’ll be happy I went the extra mile for it. Or, ya know, at least like a few blocks.